While the AnyMote preloaded database coverage is over 99% of all IR controllable devices in the wild, it's possible that the remote for your very new (or very old) TV is missing, or that we're missing a single button that you need. Thankfully, the AnyMote Home contains an IR receiver that can record commands. The receiver is usually near the "e" letter of the top logo, but can be on the "a" side as well. If you have a red dot • at the bottom of your AnyMote Home - that dot is showing the direction of the IR receiver. 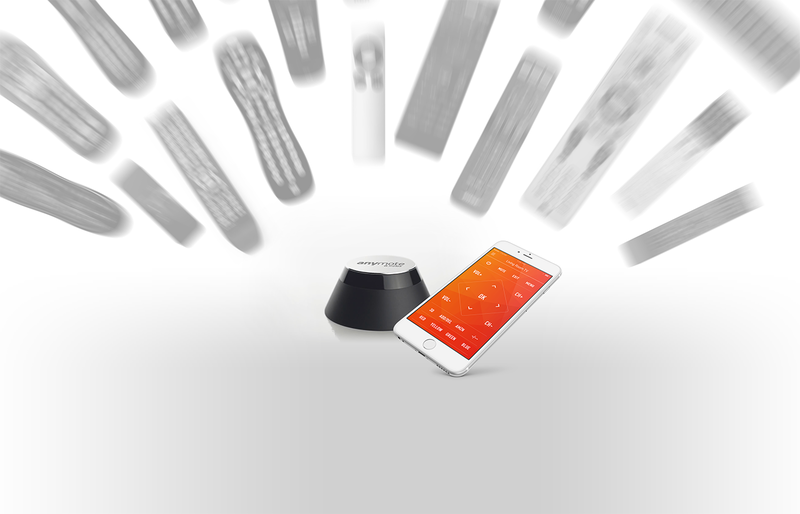 - Your smartphone or tablet paired with AnyMote and remotes set up. 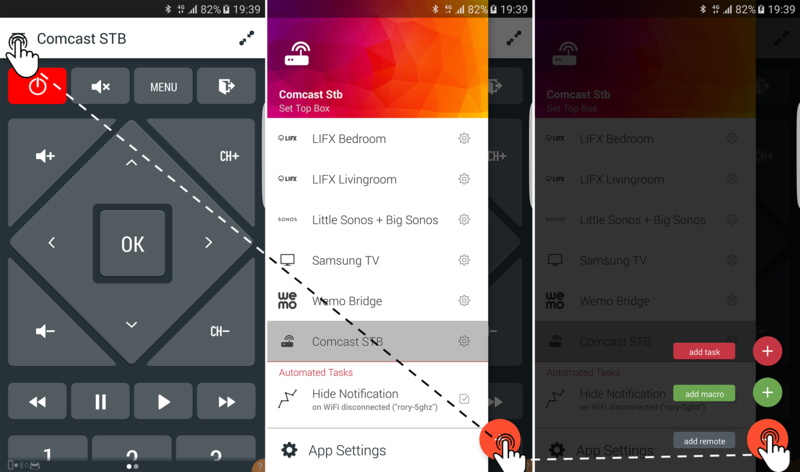 You'll start by following the classic steps for adding a remote - open the navigation menu, tap the round red plus button, and then select "Add Remote". 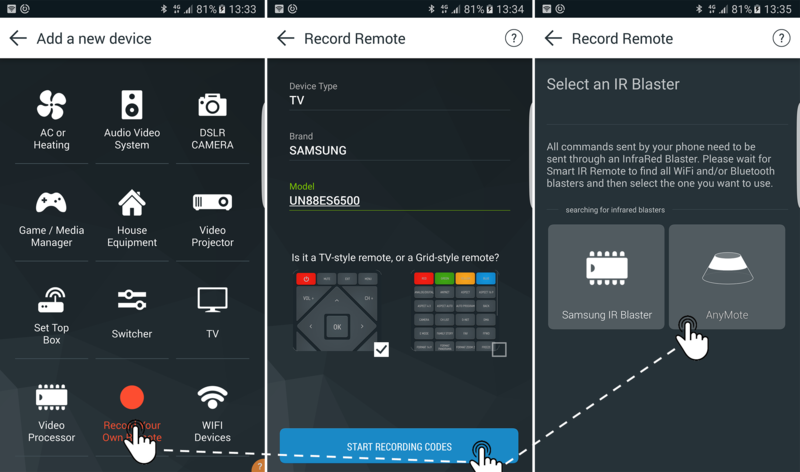 In the categories screen, tap the "Record Remote" category with the red round recording symbol, and then enter the details of the remote you want to record: the category, brand name and model, if you know it. These details will be used by AnyMote to improve your recordings, as well as asign pretty category icons. 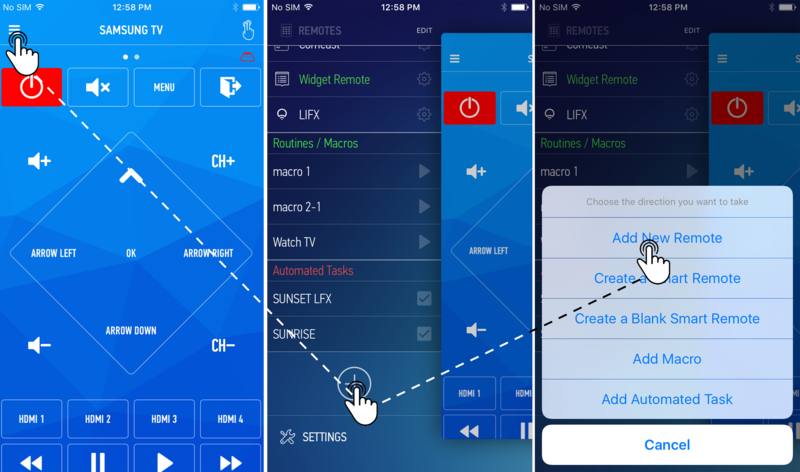 Also, here you can pick a starter-layout for your remote, and for the purpose of this tutorial we'll use a TV-style layout which has a pre-configured screen with arrows and other nearby buttons. 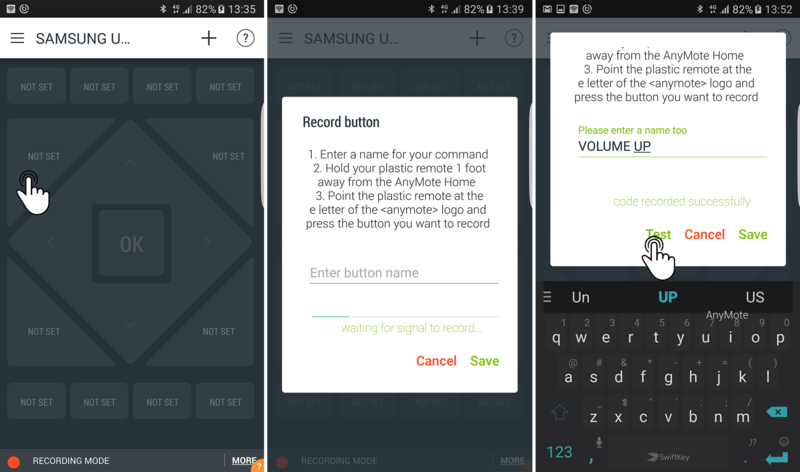 In the last step, you'll pick your AnyMote Home as the actual recorder. If you have multiple units, you now get to pick which one to use for recording. You now have a remote with some preset buttons which don't do anything. 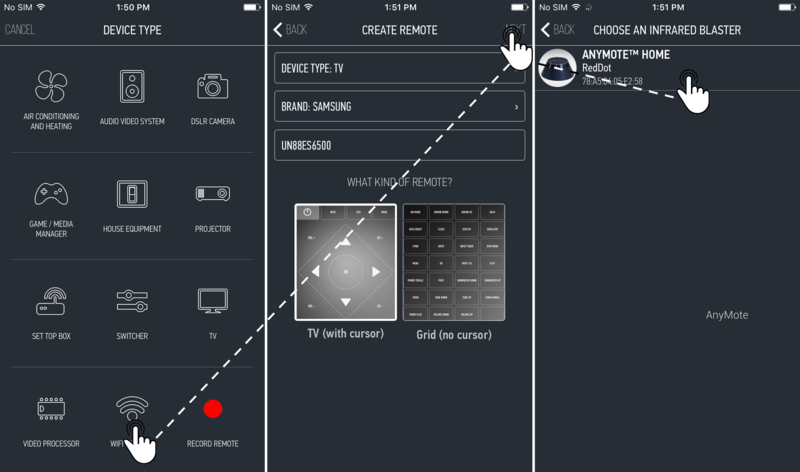 Simply tap a button to record a button for that remote. As soon as you tap it, the AnyMote will be waiting for 60 seconds for a signal from your plastic remote. - if your AnyMote has a red dot on the bottom, point your plastic remote at the shiny plastic in the direction pointed by the red dot. - if your AnyMote does not have a red dot at the bottom, point your plastic remote at the "e" letter or the "a" letter of the top logo. If the recording was successful, the AnyMote will shortly blink. You can confirm that the command was recorded accurately by pressing the "Test" button. If it wasn't, simply retry. Congrats, you've learned the basics! 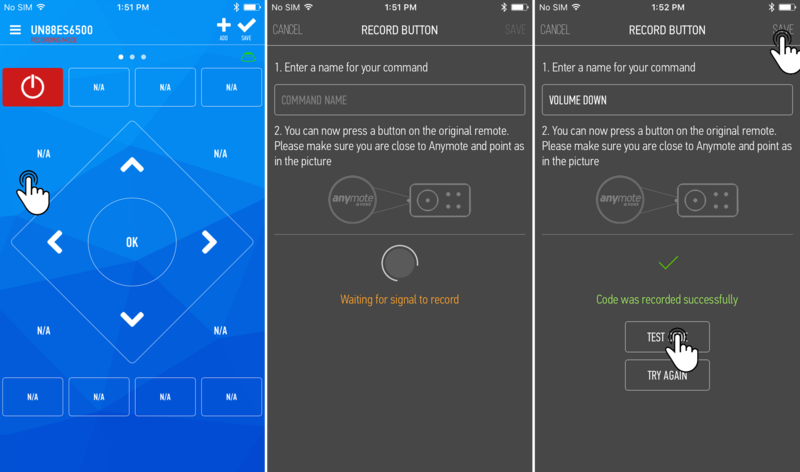 Now you can repeat for the rest of the buttons that you'd like to record. You don't need to record buttons that you don't use. Teletext ? Feel free to ignoreit! - Do very short presses (as short as you can) on your plastic remote.